5/22: Summer Reading. Originally uploaded to Flickr by Spinstah. I think the best part of this summer, which looks like it will leave plenty of time for reading, will be going to the SPL and BPL every week or so for a new stack of books. 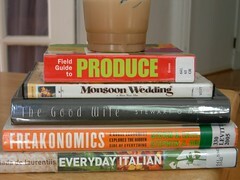 These are from a trip to the SPL this week to pick up two books I put holds on ("Freakonomics" and "Everyday Italian"). I do that a lot at the SPL because many of the books I want live at the Central Branch, which isn't really on my way to anywhere at all, and as I discovered a few weeks ago is just a *little* too far away for a casual walk to just go pick 'em up. Lucky for me, the West Branch is right in my neighborhood and I can make an adjustment to my route to the T to walk by and drop them off later. I haven't been doing well with keeping my Library Thing account updated with my reading (there are a few things I squeezed in during the semester that just aren't in there, let alone in there and reviewed). I think I will give a more concerted effort to reviewing books on the blog and see if that helps. And the geek in me loves the idea of using the digital camera to take pictures of the books and post them to flickr, then send them to WordPress and blog about them. Mwahahah! I love summer reading! Freakonomics is on my list, too, and I’ve managed to read a three or four books in the last week. The only problem is deciding what exactly to start next….